I got this hefty omnibus-edition softcover at Barnes and Noble. It's the first of a 2-volume set telling the story of a group of high school friends, including Naho, a girl who starts receiving letters from - apparently - her future self! At first the letters provide simple line-items of things that will happen that day, and when they come true Naho starts to believe in them. So when the letters tell her that new transfer student Kakeru is at risk of a tragic fate, and only changes in the actions of Naho and her friends can save him, she has some tricky decisions to make. It's a quirky plot, and the manga goes fully into it from the very beginning, presenting several full-color panels showing what seem to be different permutations of the friends in different possible futures. In a nice twist from some manga, the friends are all good people, kind and trustworthy - and surprisingly open to the growing weirdness about the intertwined futures of themselves and Kakeru. Much of the story focuses on the small details of life, and the ways in which small decisions might have increasingly-significant effects; it also has some realistic notes about individual feelings of guilt and sorrow, and about the hazards of depression. 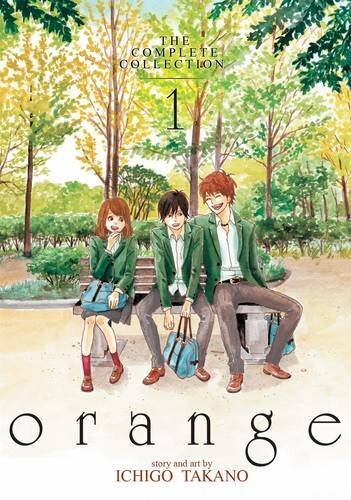 But overall it's upbeat, with a thread of suspense regarding Kakeru's danger - especially when shy Naho finds herself struggling to say the simple words that could prevent him from taking the wrong path. The story has different time-streams, too - at times we're with the adult characters as they reminisce about the sad events of the past. And when the characters get to talking about time paradoxes - well, let's just say that, improbable as all this is, the story presents a theoretical framework for it and doesn't gloss over the down side! I love the way the characters bond with Kakeru, too; even when romantic jealousy rears its head, everyone behaves decently, and while that gets poignant at times it works well. There's a huge plot-bomb late in this volume that changes everything for Naho, and may make her attempts to help Kakeru work better. Or will it just complicate things? The scenes where the friends are open with each other - using their words, offering explicit help, saying directly what they want - charmed me, and overall I really liked spending time with these people. 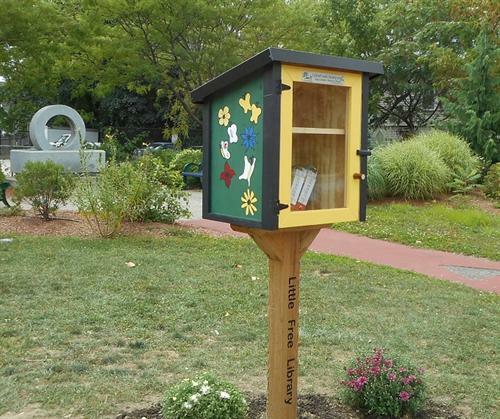 I was delighted to find that EIGHT new Little Free Libraries are being installed in Nashua; I managed to drop books at each of them today. This one is at the Park Social playground at the corner of Ledge and Pine Streets (on the site of the historic Labine building). Hope the finder enjoys the book!